Cathedral of the Pines; Mt. Monadnock in background. E. Kolb photo. I am the daughter and mother of veterans, and I think of them with love and special gratitude on this Veteran’s Day. My Canadian neighbors are right in calling it Remembrance Day. 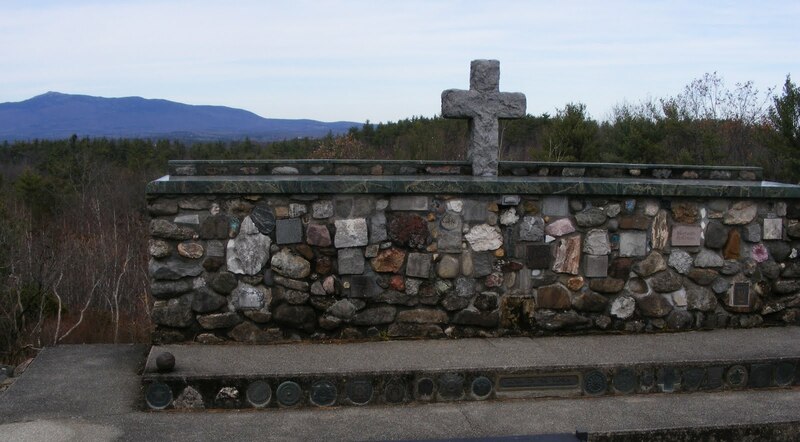 Pictured: Cathedral of the Pines in Rindge, NH, where every day is Veteran’s Day; Mt. Monadnock, southwestern New Hampshire’s most noted landmark and most-hiked mountain, is in the background. From the Cathedral’s web site: “The Cathedral of the Pines’ educational programs and public events honor service to the Nation by promoting peace, interfaith understanding, and respect for the natural environment.” Symbols of the various branches of the military are displayed on the grounds, and there’s a special memorial to women in the armed services. We spent time (not nearly enough) walking over this serene place. The altar pictured above, dedicated to our nation’s war dead, is made from stones gathered from every state in the Union. As you can see, Mt. Monadnock is just a few miles away. It’s a fitting place to honor veterans from every era. Long drive for a short walk, and worth it.